"I am more and more convinced that music, by its very nature, is something that cannot be cast into a traditional and fixed form. It is made up of colors and rhythms. The rest is a lot of humbug invented by frigid imbeciles riding on the backs of the Masters—who, for the most part, wrote almost nothing but period music. Bach alone had an idea of the truth." Claude Debussy (1862-1918) was one of the most accessible composers in music history, and if you don’t enjoy listening to his music, you may never enjoy anything from the classical repertoire. I've often told students that a great piece of music must be heard several times before it can be fully understood or appreciated. With Debussy that is generally not the case. His compositions can make a lasting impression with a single hearing, and I don't use the word "impression" lightly. Early in Debussy’s career his music was labeled “impressionist," a term that had previously been applied to a style of painting associated with artists such as Claude Monet and Pierre-Auguste Renoir. 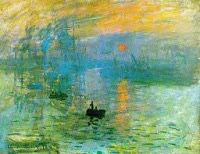 The term came from the title of Monet’s painting Impression: Sunrise (shown below) and refers to paintings that use light and color to create a soft-focus image of a scene rather than a detailed representation. By that definition, it's easy to see why some people used the term to describe Debussy's music. Although Debussy disliked the comparisons of his compositions to Impressionism, the adjectives used to describe Monet’s style of painting can also be used to described Debussy’s music. Like Monet's paintings, Debussy's music is often static and seemingly unconcerned with the need to move forward. Debussy's music might also be described as “blurred,” using harmony and timbre to create musical impressions. Like Monet's paintings, the mood of Debussy's music is more important than the image or story. Debussy disliked the music of most other composers and criticized the work of Brahms, Wagner, Tchaikovsky, and Beethoven. (He did, however, seem to like Bach.) This disdain for the music of others can be heard in the way Debussy rejected the musical traditions of past masters and created a whole new musical language. During the late 1800s and early 1900s, he provided listeners with music unlike anything ever heard before. He was an artistic revolutionary and, for that reason alone, ranks as one of the most significant composers of the last century. The best way to describe Debussy’s music is to take the following ingredients and mix them together. When finished you will have what amounted to a new type of music for the twentieth century. His music was largely programmatic, although he did not try to paint a picture or tell a story with his music as much as he tried to evoke a mood. The sounds of his native language can be heard in his compositions. Debussy was French, and — like the language he spoke — his music was generally free of sharp accents and harsh consonants. His music emphasized “color” through his creative use of musical timbre. He used instruments either by themselves or in unusual groupings to create sounds that had never been heard in an orchestra. His music provided unorthodox harmonies and melodic lines. Generally unconcerned with whether his themes were set in a major or minor key, Debussy employed harmonies designed to evoke a certain mood, using whole tone scales (play C – D – E – F# – G# – A# – C on a piano), pentatonic scales (play the black keys on a piano), and chromatic scales (listen to the flute at the beginning of The Afternoon of a Faun on the video embedded below). Although Debussy’s music was shockingly original when it was first composed, it did not cause the same social earthquake as other modernist music of the early twentieth century. Debussy was as much a revolutionary as composers like Stravinsky and Schoenberg, but the benevolent sound he created did not give people a sense that he had turned the musical world upside down — even though he had. "Love of art does not depend on explanations, or on experience as in the case of those who say, ‘I need to hear that several times.’ Utter rubbish! When we really listen to music, we hear immediately what we need to hear."